Our newly graduates, Rev. 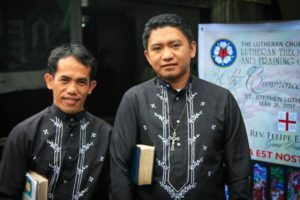 Nap Sindac Lumecio (right) of St. Paul Lutheran Church in Tawangan, Kabayan, Benguet and Rev. Fred Walang Sibaen (left) of the Holy Cross Lutheran Church in Dangdangla, Cardiz, Bagulin, La Union. The Lutheran Theological Seminary (LTS) and Training Center of the Lutheran Church in the Philippines in Baguio City celebrates its 36th Commencement Exercises in May 31, 2017. “Lift up your eyes and see that the fields are white for harvest” from the book of John 4:31-38 served as the theme. The St. Stephen Lutheran Church with its Parish Pastor and LCP Vice-President Rev. Felipe B. Ehican, Jr..gladly hosted the graduation ceremony. The faculty headed by the Dean Teodorico L. Taran Jr. , Rev. James D. Cerdeñola, Rev. Abel Cesar T. Villos, and Rev. Wilando T. Roa and Rev. Alois Schwarz joyfully took part in the ceremony as they presented the graduates. The presence of the Board of Control with its Chairman Rev. Daniel Pondevida and members Rev. Jerry Lomicio, Rev. Antonino Batin, and Rev. Nicodemus Tuban made the occasion more meaningful when they certified and confirmed the graduates and conferred them the degree of Bachelor of Theology. But the event could not be completed without the two most important persons, the graduates, Rev. Nap Sindac Lumecio of St. Paul Lutheran Church in Tawangan, Kabayan, Benguet and Rev. Fred Walang Sibaen of the Holy Cross Lutheran Church in Dangdangla, Cardiz, Bagulin, La Union. Along with the two pastors, 12 Completers of TEE (Theological Education by Extension) Program and 4 Seminarians to be sent on their field works are also dedicated. Some highlights during the 36th Commencement Exercises of Lutheran Theological Seminary & Training Center. Edgar S. Toclo is a member of United Lutheran Church, La Trinidad, Benguet and President of the Philippine Lutheran Youth League.